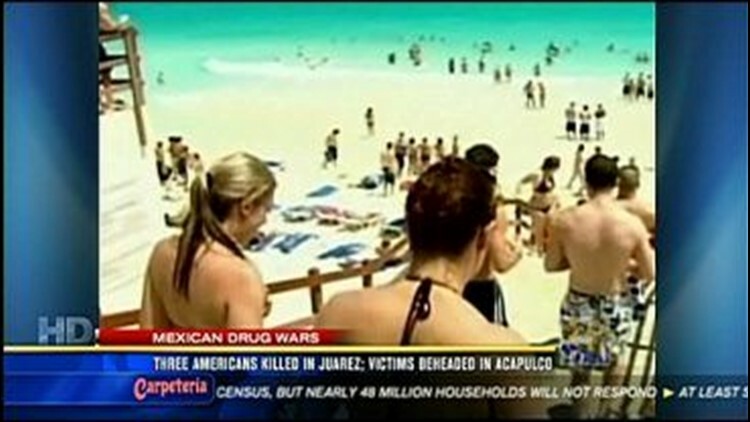 (CBS 8) - Mexico's upswing in drug-related violence is now spilling over into popular tourist areas, as hundreds of young people head south of the border for Spring Break. Three people with ties to the U.S. Consulate in Juarez, Mexico were gunned down in that violent border city over the weekend. Consulate employee Arthur Redelfs and his wife Leslie Enriques were killed in a drive-by shooting. Their baby survived the attack. A short time later the spouse of another consulate employee was murdered. This just two days after gunmen opened fire at a funeral in Juarez, killing six people, including a 2-month-old baby and a 14-year-old girl. To the south, along the Pacific in the popular tourist resort of Acapulco, there was an even more gruesome weekend. Early Saturday, 13 people were killed including five police officers. Four of the victims were beheaded. All, undoubtedly, the dirty work of Mexico's ruthless drug cartels. "These individuals that are carrying out these beheadings are doing it as a signature and to send a message to their opponents, that is a message that is intended to terrorize," Brian Jenkins of the Rand Corporation said. Mexico is in the grip of hyper-violent drug gangs battling on the streets for control of the smuggling routes to the illicit U.S.drug market worth as much as $40 billion a year by some estimates. Not even President Felipe Calderon's declaration of war with 45,000 troops has been able to stop the traffickers or the violence. Still, despite the violence and U.S. government travel warnings, Mexico remains a popular Spring Break destination. Some 200,000 students from around the world descend on Cancun annually. MTV is hosting its Spring Break extravaganza in Acapulco this week. The U.S. State Department wants government employees in six Mexican cities, including Tijuana, to tell their family members to leave. It's also urging Americans to delay unnecessary travel.